Over the last several days I have enjoyed several posts where writers have selected #oneword to capture their goals, dreams and ambitions for the upcoming year instead of writing an endless list of resolutions. Some of my favourite authors have shared meaningful words such as ENERGY, BLOG, REFLECTION, CREATIVITY, MINDFUL and PURPOSE. Along with their selected word, these inspirational bloggers also wrote about the rationale behind their selection and the steps that they are planning to take in order to breathe depth and life into their #oneword. I’ve spent the last couple of days pondering what my #oneword might be. I was immediately drawn to my favourite word ~ Serendipity, but then wondered if indeed I was prepared to spend the next year reflecting on and writing about my serendipitous interactions. I decided to leave that word where it currently resides which is in my personal sphere of notoriety. Then this morning, as the worship team at church opened the service, my #oneword (which happened to be the title of the song) became clear. Sheryl serenaded the congregation with her incredible and powerful version of Natasha Bedingfield’s “Unwritten”. As the lyrics accompanied her vocals on the screen, it became apparent that UNWRITTEN was going to be my #oneword for 2016. When I think about the upcoming year, I love the idea of “pen in my hand, ending unplanned” and “breaking tradition and that sometimes my tries will be outside the lines”. The pen in my hand will be my pledge to continue to write, to share, to reflect, to highlight the work of others and to inspire others to do the same. I would love to see us double the number of educators in our system who are sharing their stories. For a current list, check out Voices From the Valley. With no planned ending, the possibilities become endless as does the journey that a brand new year affords each of us. I pledge to enjoy the ride and embrace and welcome those who choose to be co-pilots. I have never been a slave to the past, so I will continue to break tradition ~ as we look for better, more effective ways to engage all learners. And finally, as for “my tries”, I wouldn’t be effectively doing my job, if I wasn’t pushing the envelope and exploring what lies beyond the “lines”. We haven’t arrived yet in terms of completely understanding the complexity of learning and teaching ~ nor do I expect that we will within my lifetime. But this year, I want to be a part of a team that is willing to write a few more chapters. 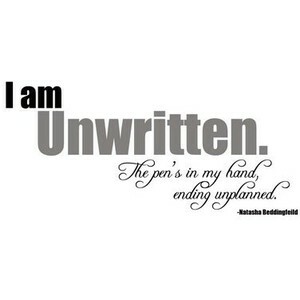 It may sound counterintuitive, but I look forward to writing about being “unwritten” in 2016.